Auschwitz was the most notorious and horrible of the concentration camps during World War II. Over a million innocent people were murdered at the camp located in Southern Poland (which was “annexed” by Nazi German forces at the beginning of the war). Survivors, of which there were only about 200,000 of the 1.3 million that were sent there, reported that when it came time for them to be paraded up a long ramp and “inspected,” there was always one SS official who would stand off to the side. He would gesture to the soldiers, giving his decision about which people would be placed in work camps and which ones would be sent to their death in the gas chambers. The survivors came to call this man the “Angel of Death” due to his direct connection to theirs and their loved ones’ fate. This man’s real name was Josef Mengele. 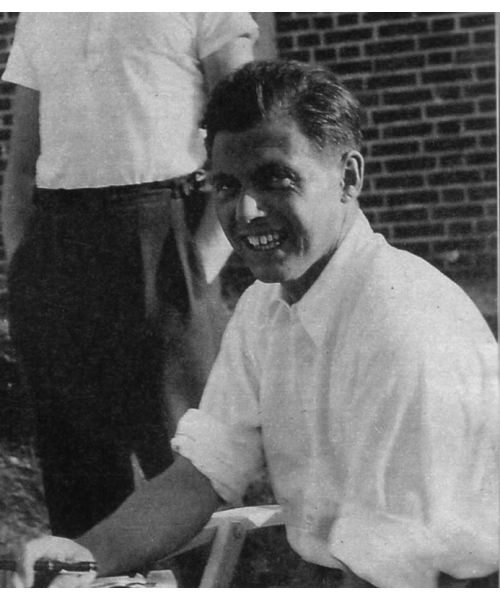 Josef Mengele grew up wealthy in Gunzburg, Germany. His father, Karl Mengele, fought in World War I, while his mother took over the family threshing production business. When the war ended, the company, simply named Karl Mengele, took full advantage of a peacetime hike in production and became the third largest company of its kind in Germany. According to Gerald Posner’s book Mengele: The Complete Story, the factory became Gunzburg’s largest employer and the Mengeles became the town’s wealthiest family. According to a few unverified reports, the factory still exists, with many jobs attached to it, in Gunzburg today. Meanwhile, Karl Mengele himself had joined the Nazi party due to his belief (and, as it turned out, not wrongly) that it would be a profitable move for him and his company. Aligning with the soon-to-rise political power not only kept the Mengele family in business, but allowed it to prosper. For the Nazis, their particular brand of eugenics stemmed from the belief that the German and Aryan race was the master race and those who threatened to “weaken” it must be sterilized or simply just killed. As one can imagine, this encompassed many groups of people – those of Jewish origin, anyone with a physical deformity (even being deaf), “gypsies,” homosexuals, people of African origin, etc. In fact, one of Mengele’s teachers was Ernst Rudin, the man behind Hitler’s compulsory sterilization laws that were enacted in 1933. Fully ingrained in this world and his studies, Mengele received his PhD in anthropology (while also studying to be a doctor) with his thesis “Racial Morphological Research on the Lower Jaw Section of Four Racial Groups,” which basically concluded it was possible to identify races based solely on jaw lines. He worked his first job at a hospital and, then, in 1937 was hired as a research assistant at Third Reich Institute for Heredity, Biological, and Racial Purity at the University of Frankfurt. He was taken under the wing of Otmar Freiherr von Verschuer, who took interest in twin research and said that Hitler was “the first statesmen to recognize hereditary biological and race hygiene.” Mengele quickly became Verschuer’s protege and he officially was made part of the Nazi Party in 1937 and the SS (Schutzstaffel) in 1938. In 1942, Verschuer got Mengele placed out of harm’s way and into the Kaiser Wilhelm Institute for Anthropology, Human Genetics and Eugenics. There, Verschuer and Mengele continued their work together. In 1943, with Verschuer’s blessing, he applied for work at Auschwitz to take advantage of the prisoners there. He was accepted and thus began Mengele’s most notorious work. Mengele arrived at Auschwitz when it housed nearly 140,000 prisoners. It was an enormous complex, that if it wasn’t designed to commit unspeakable horrors, could have been admired for its organization. It had several libraries, its very own soccer stadium, theaters, swimming pools, and even a brothel. Mengele quickly took advantage of his new position when the camp was in a the middle of a typhoid epidemic. Instead of treating it, he sent thousands of people stricken with the disease to the gas chamber. Mengele, like his mentor, took great interest in the medical attributes of twins, especially children. He would routinely separate twins, sometimes killing one to see if the other could “sense” it. He would study the differences and similarities between the two, often the eyes. To do this, he would gouge out the eyes, among many other similarly appalling experiments. The Soviet Armed Forces (the Red Army) captured Auschwitz on January 27, 1945, but Mengele had already fled by then. He traveled around occupied German territories, evading Soviet and American forces while carrying with him several boxes of medical records. He worked as a farmhand, until he went to Genoa in 1949 and, then, a few months later, he took sanctuary in Argentina. His wife Irene refused to go with him and they divorced. He chose Argentina, like many of his Nazi colleagues, because the government was firmly pro-Axis, thanks to President Juan Dominego Peron’s fascist admiration. To this point, German was taught in many Argentinian schools. With open arms, Peron accepted Nazi fugitives, not just for ideological reasons, but financial as well. Many of these escapees brought wealth with them often looted from former prisoners. Argentina is where Mengele lived the next five years of his life, mostly under a false name, working as a small pharmaceutical business owner and farmer. After an incident where a girl he tried to perform an abortion on died, he left for Paraguay. In May 1960, the Mossad (the Israeli Intelligence Agency whose job was to track down Nazi war criminals and bring them to Israel for trial) captured Adolf Eichmann. They turned their attentions next to Mengele. During the Nuremberg Trials in 1945/1946, Mengele’s name was mentioned several times, but Allied forces thought he was dead. The Mossad knew otherwise. Much later, it is almost universally thought that the Mossad had found Mengele living in São Paulo, Brazil in 1962. But, due to budgetary concerns and the ongoing dispute with Egypt, the Mossad was called back home and could not pursue. Josef Mengele went on to live another 17 years in relative seclusion and deteriorating health, with recently published journal entries indicating he never changed his political ideologies nor showed any remorse for his actions. He had a stroke in 1976 and died in 1979. He was buried under the false name “Wolfgang Gerhard” in Brazil. It wasn’t until 1992 that authorities exhumed the body and DNA proved that this Wolfgang was, in fact, Josef Mangele, Auschwitz’s Angel of Death. Perhaps a warning on the graphic nature of the article? I understand it’s important to get the facts out, but a person needs to be prepared for what is being said — it’s really disturbing; especially for younger readers. The title of the piece is ‘The angel of death’ and the very first sentence is ‘Auschwitz was the most notorious and horrible of the concentration camps during World War II’. Pretty obvious that this piece won’t be about puppies from a shelter getting re-homed. I very much doubt that “budgetary concerns” held the Mossad back because many (especially surviving Jews in the US) would have given the financial backup to bring this evil monster to justice…. This is a fake story and didn’t happen the way it’s written. Mengele as other top ranking National Socialists were Ashkenazi Jews. Auschwitz was a work camp and there wasn’t any mass killings there. At least some of us have the truth.